What is the best burger made of? I believe the best burger should have delicious fresh buns, delicious sauce, meat and a fresh finish, something green! This recipe is a great alternative to the classic beef burgers, which take forever to prepare at home. 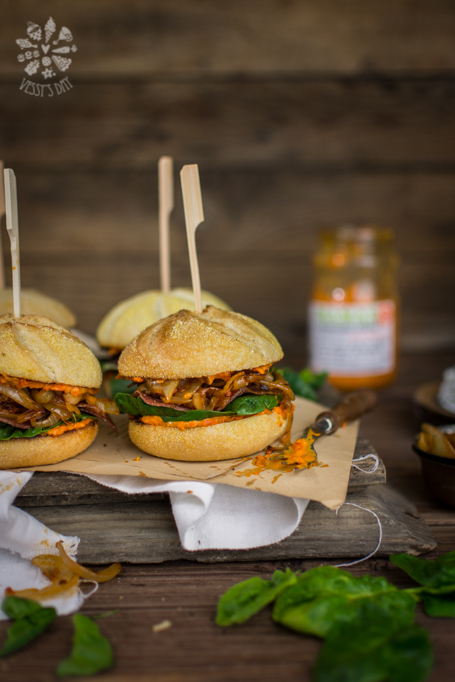 To prepare these super delicious mini burgers you will need onions – of course caramelized onions, they are perfect for burgers, some kind of salami – pick your favorite, fresh spinach and spicy ajvar, which I used instead of burger sauce and spices. Ajvar is so full of flavors that you will not need any additional seasoning or sauces, only simple ajvar, but pick a spicy one – this is the best for burgers. If you don’t have ajvar on your hands, or you can’t find it in your area, let me tell you what it is – it is a dip, prepared from roasted red peppers, roasted egg plants, seasoned with sunflower oil and sea salt, and the spicy flavor comes from roasted red fefferoni peppers – yummy! Don’t hesitate, get cooking, you will love this burgers! Heat a little bit of olive oil on medium temperature in a large skillet. Add the onions. Cook until golden brown and soft. Make sure to cook the onions on medium-low temperature, so they can cook all the way through without burning. Add a couple of tea spoons of spicy ajvar and stir. Transfer the onions in a small bowl. In the same skillet heat a little bit of olive oil and grill the buns, cut in two. 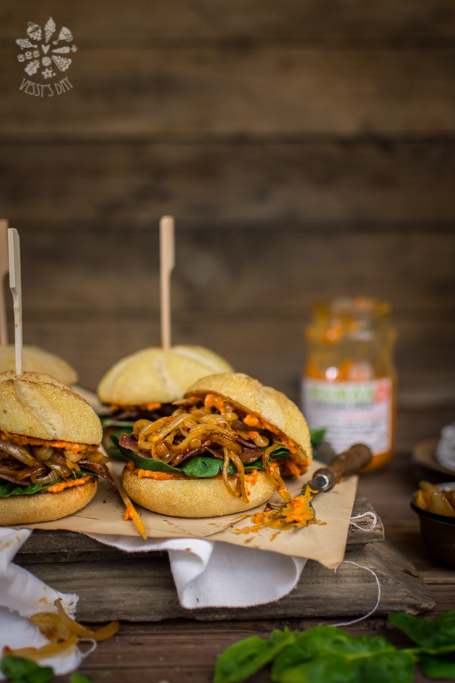 To assemble the burgers: Spread a little bit of spicy ajvar over both halves of the buns. Top the bottom half with fresh spinach, salami and the onions. Cover with the second half of the buns and serve immediately.